This line, near the beginning of Will Eno’s The Realistic Joneses, now playing at Theatre Wit in a joint production with Shattered Globe, is somewhat emblematic of the whole script. 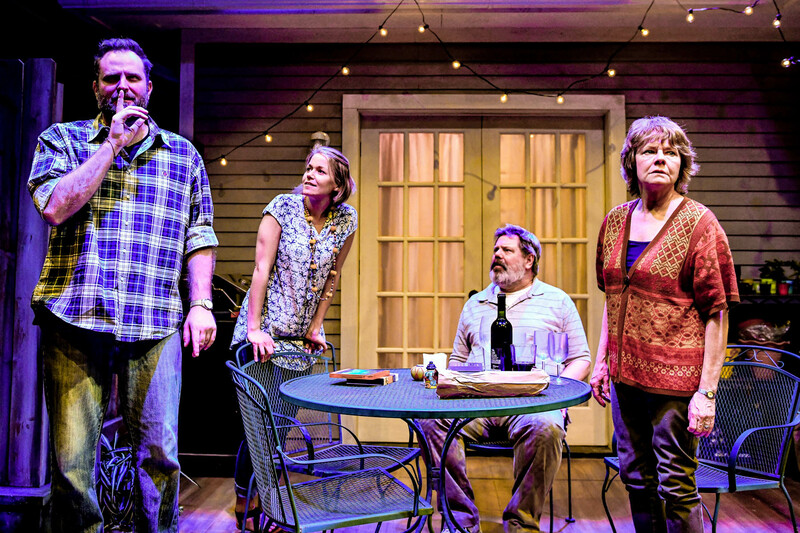 Named to the New York Times’ list of 25 most important plays since Angels in America, The Realistic Joneses is a quiet, contemplative play but nonetheless one in which Eno can showcase his powerful talent for wordsmithing and comic interplay. In this show, centered on two families named Jones, we can see ourselves reflected “realistically”; that is, with all of our quirks and issues and foibles. Director Jeremy Weschler, who has done four Eno shows, knows his way through the playwright’s light-hearted but poignant dialogue, and he has a strong cast to work with here. The play begins with Bob and Jennifer Jones sitting quietly, enjoying the night, in their back yard. Even here, though, we can catch moments of telling dialogue that show Eno’s style: crisp and clear and comical. JENNIFER. It just seems like we don’t talk. BOB. What are we doing right now? Math? JENNIFER. No, we’re – I don’t know – sort of throwing words at each other. Into this moment come new neighbors, also named Jones (John and Pony), who have dropped by to chat and introduce themselves. Through the course of eleven self-contained scenes, we watch, laughing frequently, as the Joneses orbit each other and interconnect, freely drifting through each other’s lives. We learn that Bob (HB Ward) is suffering from a debilitating and degenerating disease that affects both the body and the mind, and that the best doctor in the country for that disease lives in this town. John (Joseph Wiens) also suffers from the disease, though Pony (Courtney McKenna), almost determinedly innocent of such matters, is unaware. All she knows is that her husband “checks out” at times, and it worries her. Like Jennifer (Linda Reiter), she is stuck in a situation she never expected, and it frightens her. The two men handle their disease in very different ways. Bob is basically in denial; he lets Jennifer worry about everything for him. John, though his mind tends to wander, is at least a little bit more proactive: he chose this town specifically because of the presence of the doctor. And though he is clearly having problems, he treats everything with humor, his way of deflection. When Jennifer tells him about Bob’s disease, for example, she apologizes, but he takes it in another direction. JENNIFER. I’m sorry. I just kind of blurted all that out. JOHN. That’s all right. That’s what separates us from the animal. You never hear animals blurting things out. Unless they’re being run over by a car or something. Eno’s sense of humor, as seen here, is gently absurdist. Throughout the play, he weaves in responses that highlight John’s quirky sense of humor. BOB. Well, you know what they say about still waters. JENNIFER. I think he means: they run deep. JOHN. Okay, but, we both have a point. JOHN. Something always happens. That’s the beauty of night. It’s the beauty of time itself. Pony, meanwhile, realizing there is something terribly wrong with her husband, fears taking it all on: “I’m trying to face things. I mean, not everything. Oh my God, can you imagine – one person facing everything? McKenna and Wiens both have a lot of fun with these Joneses and their quirkiness. They have a relationship that may not run as deep as Jennifer and Bob’s, but they understand each other well. JOHN. This was fun. I mean, not fun, but, definitely some other word. One of the best things about Eno’s dialogue is that is is, as the title says, realistic. Though this play is very funny, it is not stuffed with bon mots and clever comebacks that sound scripted; rather, it relies for its humor on the way people actually talk to each other. JOHN. Did you hear me listening, just then? JENNIFER. Oh, is that what that was. JOHN. The secret is not saying anything. JENNIFER. That’s, yeah, that’s actually pretty good advice about listening. Reiter, as Jennifer, has the least quirky role in the play. She is desperately trying to help a husband who refuses to admit he needs the help, and her frustration, at times, understandably percolates over. Still, she is able to reflect on the beauty of life as we live it, whether enjoying the call of an owl or even thinking about listening to radios at night. JENNIFER: I love listening to the radio. You know when you get some little baseball game, a thousand miles away, or the lonely deranged nighttime guy? It just seems like people. And that’s the whole thing: this is a play about people. People going through a terrible time, true, but people. Eno is making no grand statements and needs very few monologues to make his points. He paints his characters as thoroughly human, and that’s enough. Weschler has assembled a strong creative team for this play. Jack McGaw’s realistic set (is there any other way to handle this play?) is clever (though at times a bit slow in transitioning from one scene to another). John Kelly’s lighting is lovely, and Christopher Kriz’s sound design adds to the moments without becoming intrusive. Every element of the production supports the words, as it should be, especially when the words are as well-constructed as Eno’s. JOHN. I was wondering, my life, is it a billion little words, or, is it just one? PONY. It’s just one. Life. Your life. JOHN. Yeah, maybe. It seems like more. All of our lives seem like more to us, and that is the essence of Eno’s play. We are watching people who could be us dealing with difficult times as well as they can. It’s nothing earth-shattering, perhaps. Or, perhaps, in its very simplicity, it is. The Realistic Joneses is a joint Theater Wit and Shattered Globe production now playing at Theater Wit, 1229 W. Belmont, Chicago until Mar 9. Check the website for specific dates, times, and tickets. Find more information about current plays in our front page recs and at theatreinchicago.com.